Photo and media storage is more ambiguous. It could mean a hardware solution that perhaps attaches to the bottom of the Theta. But it could be an extension of the theta360.com site that allows automatic backup of images or something similar. 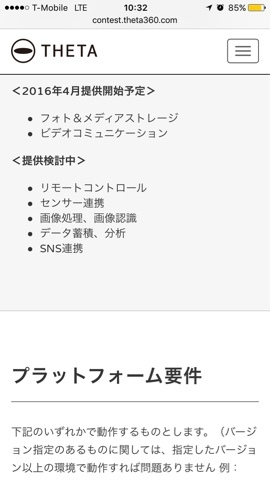 Remote control, SNS linking (probably increasing the social media sharing options), and image processing were also expected (from my previous post). The latter seems to mean adding to the image editing capabilities of the Theta+ app. I’m not sure about sensor collaboration. Does it mean licensing tech from other companies or to other companies, or something else entirely? Anyway, it looks like the Theta will have a few new capabilities in the near future. UPDATE: April will be a big month for the Ricoh Theta. Here’s why. To see other related posts on the Ricoh Theta and other topics, click on the label/tags below (below the sharing icons), or check the tag cloud on the right side of the page.